Shortages of medical staff have been identified as one of the major impediments to achieving the health-related UN Millennium Development Goals (MDGs). For example, one of the poorest countries in the world, Mozambique, has just 548 doctors for a population of more than 22 million, according to the UN World Health Organization (WHO). Chad - With fewer than one doctor for every 20,000 people and just four hospital beds for every 10,000, Chad has one of the worst health-worker shortages in the world. Many countries are bolstering their staff with community health workers, but according to WHO's World Health Statistics Report 2010, Chad has just 154 of these. The country requires 300 percent more health workers because of increased healthcare needs and a reduction in the medical workforce from HIV-related illness or death. Burundi - Malaria is responsible for 40 percent of health-centre consultations and 47 percent of in-patient deaths in Burundi, but there is just one doctor per 34,744 people and two nurses per 10,000. The government provides free maternal and child healthcare and free treatment and care for people living with HIV, but the country's lack of skilled health professionals has severely hampered this programme. Ethiopia - One of Africa's most populous nations, Ethiopia is extremely short of doctors, with fewer than one doctor for every 36,407 people. Research shows that Ethiopia's public health sector is losing as many as 26 percent of its physicians to private healthcare and to other countries. To cope, the Ethiopian government has rolled out a "health extension worker" programme, training an estimated 30,000 lay health workers to improve primary services in rural areas. Today, there is one health extension worker per 2,500 people. 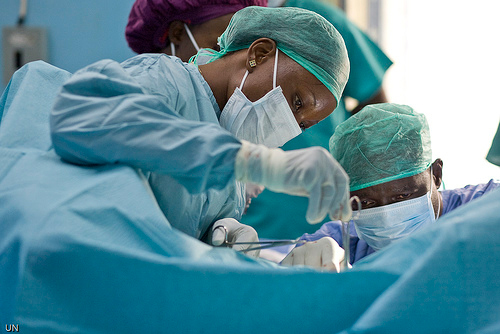 Tanzania - The Ministry of Health reported in 2007 that the country had 1,339 physicians, mostly in the Dar es Salaam region, which had at least one doctor per 10,000 population, six times the national average. Many regions have a ratio as low as 0.1 doctors per 10,000 people. The country has trained "assistant medical officers" (AMO) to cope with the shortage. There are about as many AMOs as there are physicians in Tanzania. Somalia - Ravaged by civil war for nearly two decades, it is unsurprising that Somalia has one of the worst health-worker shortages in Africa. A poor road network and limited number of health facilities compounds the lack of access to healthcare. A 2009 study of three districts in south-central Somalia found just 11 doctors serving a population of about 600,000; the same population was also served by 161 nurses and auxiliary nurses and 32 community health workers. Liberia - Still recovering from a 14-year civil war that ended in 2003, Liberia has just 51 doctors, according to the WHO. Fewer than half of all births are attended by a skilled health professional, and maternal mortality is very high, at 994 maternal deaths per 100,000 live births. NGOs such as Merlin are training midwives and community health workers to boost numbers, but the situation remains critical. Sierra Leone - In March 2010, health workers in Sierra Leone won a six-fold pay rise from the government to cope with a likely deluge of patients seeking treatment following the introduction of free medical care for pregnant women and lactating mothers and children under five. Nevertheless, Sierra Leone has a serious health worker gap, with about three doctors per 100,000 people. The country is using Cuban and Nigerian doctors to fill part of the personnel gap, but concerns remain that the limited health workforce will not cope with the burden of free healthcare for large sections of the population. Malawi - With an estimated two doctors for every 100,000 people and a 60 percent vacancy rate for nurses in rural areas, Malawi has turned to “task-shifting” - the use of less qualified health workers. A new cadre of health worker, called a health surveillance assistant (HSA), carries out tasks usually handled by highly trained physicians. In 2007, for example, 95 percent of 625,000 HIV tests were performed by non-medical counsellors. Malawi's task-shifting seems to be paying off, but there has been some criticism of the short training period of 10 weeks for HSAs, and suggestions that rigorous selection is being sacrificed in the attempt to meet recruitment targets. Mozambique - The country has fewer than three doctors per 100,000 people, half of whom operate in the capital, Maputo. Political instability and economic structural adjustment programmes in the 1980s hit Mozambique's health system hard, forcing the closure of up to 50 percent of public health centres. The country relies largely on “técnicos de medicina” - non-physician clinicians who undergo training for 30 months - to provide the clinical and managerial tasks carried out by doctors. It aims to have trained close to 1,000 técnicos by the end of 2010. Mozambique has been able to significantly scale up its antiretroviral rollout through técnicos, but a 2007 evaluation found that their training had not adequately prepared them for clinical responsibilities, while existing health-system resources were inadequate for providing care. The government is re-evaluating the técnicos scope of practice. 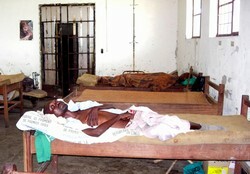 Niger - The country has just 288 doctors for a population of 14 million and one of the worst health crises in the world. Niger is in the grip of a severe food crisis, and health centres are struggling to cope with high numbers of cases of severe malnutrition. Almost 90 percent of health workers are in cities - leaving rural areas with 885 medical staff, according to 2008 Health Ministry data; 40 percent of all health workers operate in the capital, Niamey.